my first Kiss concert: July 14, 1996 During the Reunion Tour. The concert was so special to me because it was a Birthday Present for me and I always wanted to see Kiss when I was little. And I got the chance to see them. I already met Kiss in person: From a distance at the KISS Farewell show, Ace almost threw a guitar pick at me, and Gene pointed at me twice. 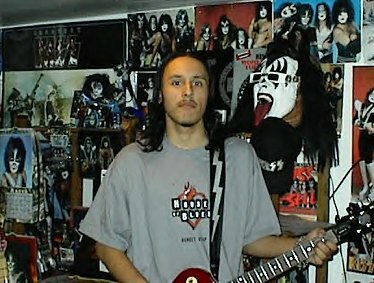 my Kiss-story: It's not with the Orginal members but with Bruce Kulick, It happen at a KISS convention, I went to the washroom to take a pee, and beside me was Bruce himself, I was in Shock, I didn't know what to say, I didn't want to shack his hand, All I said was What's up and he replied back. Thats was so cool. Now I could say that I took a piss with Bruce Kulick.